Galaga Web | BANDAI NAMCO Entertainment Inc.
― How was Galaga born? ― So, Galaxian was created using the same hardware? Yokoyama – At first, we based our development off of the Galaxian board and developed some prototypes, but Ishimura-san, the hardware expert at the R&D Center, mentioned that they were going to develop a new board. When we heard that, we decided to go back to the drawing board, and this marked the beginning of Galaga. ― That means the planning was in motion for a long while. Yokoyama – Not exactly. Even if we were in planning for a while, the development span was very short. In fact, I wrote the first draft of a design document in a little less than 2 months after the completion of the previous game I worked on. ― You mentioned that the direction was to create something related to space, but that seems to imply that the game to be created wasn’t planned to become a sequel to Galaxian. Yokoyama – Well, we didn’t really set Galaxian to be some sort of benchmark for the game, but back then, other companies were creating games similar to Galaxian, whereas we (Namco) were creating games such as “Pac-man” and “Rally X” (*7), so our Marketing group commented saying that we should at least make 1 more space themed game, so then we just followed through with that. ― Did you create Galaga by coming up with a design yourself, and in tandem with the programmer (*8)? Yokoyama – That’s right. First I come up with a design document that the programmer could follow. Back then, we didn’t have something like an evaluation committee, so it was a bit easier to come up with all sorts of plans and designs. 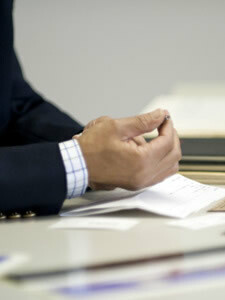 In fact, the moment the Section Chief or Director says “let’s do it,” things were put to motion. ― Was the idea of having the enemy capture your spacefighter which could then be used to combine with later made from the beginning of design? ― If so, were you inspired or tipped that motivated that design? Yokoyama – Back then, our Prototype Stage had a Prototype 1 and a Prototype 2 stage. During Prototype 1, we created the game where the enemies populated the screen by flying in on a different route than what was used in Galaxian. You could already play the game then, but in honesty, it really lacked any appeal. The appeal of Galaxian is that you could maneuver through enemy fire to defeat the enemies. Again, that was already available then, but it wouldn’t differentiate the game from Galaxian. That’s when I came up with an idea of having the enemies conduct a different method of attack. So then I was watching a movie (I can’t seem to remember the name of that movie) and in that movie I saw beams being fired. ― Beams? As in tractor beams? Yokoyama – Yes. It was then it dawned on me, “why not have the enemies shoot a beam that doesn’t simply destroy, but rather captures their target?” Think of being captured naturally led me to think of finding a way to rescue what was captured. Yokoyama – When I started to work on that idea, I initially thought of rescuing the spacefighter and putting it back into the player’s stock (life). But that wouldn’t be any different from Extend (*9), so then I came up with the Dual Fighter mode. Once that was set, the only thing left was to determine whether the spacefighter should combine next to each other or on top of each other. ― On top of each other would have been interesting (laughs). ― How was the unique Challenging Stage created? Yokoyama – In “Pac-man” there’s something called a “Pac-man Show” (*10) that appears after 2 stages are cleared, and in “Rally X” there’s a Challenging Stage. So I thought, “why not Galaga, too?” We needed something to liven-up the game, but we didn’t really know what to do. While we were thinking about it, one of our programmers, Ogawa-san (*11), caused a bug which made the enemy formation simply fly off the screen. I was called over, and he asked me whether there was a way to use that bug (laughs). ― I’m assuming Ogawa-san thought that was interesting (laughs). Yokoyama – That bug also prevented the enemies to shoot their missiles. It was then we discussed that it could be fun shooting them as they showed up, and decided to make this into the Challenging Stage. So really, it just happened by fluke. ― So, it started flesh out from there? Yokoyama – Well at first, we only made a stage that featured that 1 pattern which was caused by the bug. Going through development, we always wanted to make the game as entertaining as much as possible, so we started to make a whole bunch of patterns. 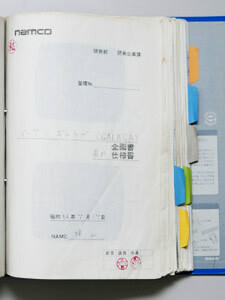 It helped a lot when Ogawa-san said that he could make them as long as the previous program he made was incorporated. Ogawa-san was, not only skilled as a programmer, but also knew a thing or two about games, and that helped especially when I suggested new features which he would jump on right away as long it sounded fun. Really, without Ogawa-san, I doubt we could’ve made Galaga to what it is now. ― Come to think of it, the character that appear in the Challenging Stage keeps changing. Yokoyama – During Prototype 2, we wanted to add more variation to the enemy attacks, so I added a feature where they conduct transformation attacks. Since we already made this character we decided to use them for the Challenging Stage to add variety. ― That kept players interested to find out what the next Challenging Stage featured. ― Were the character images created by you? Yokoyama – That’s right, just the images. At first it isn’t like the game you see today. It was closer to what you saw in “Galaxian.” It was from Galaga that we had a designer actually design characters for games. This character here was drawn by Ohno-san (*12), a specialist who studied extensively on designs. ― So the person who came up with game plans were keeping watch of everything. Yokoyama – Back then, I was keeping watch over 3 games. This game (Galaga) I handled everything myself. For “Bosconian” (*13) and “Dig Dug” (*14) I had a number of juniors assigned to them, so they helped me with my work on them. ― You were working on multiple games at the same time? That must have been difficult. 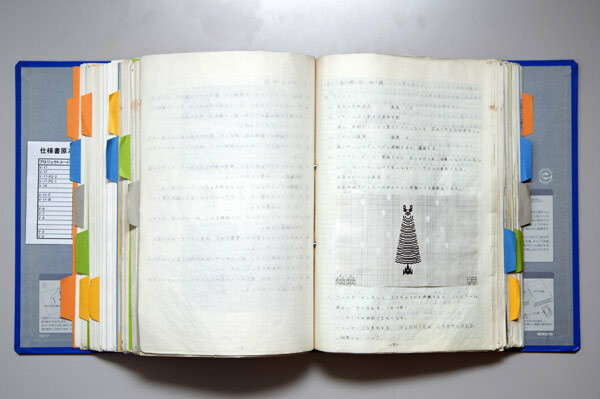 Yokoyama – I was making the final calls on Galaga game features. In turn, for Bosconian, I had my juniors make a call on the game features. As for Ohno-san, drawing pixels weren’t the only duty he had, so Ohno-san basically handled the graphic designs, while drawing all the sub-characters were done between myself and my juniors. ― Did you come up with the name “Galaga,” too? Yokoyama – In regards to that, I recall the division chief handling designs mentioning that he wanted to use “Gala” from “Galaxian.” The “-ga” is from the Japanese word, “moth,” and I think there was some meaning in English, too? In any case, that person came up with the word “Galaga.” Nakamura-san (*15) had the final say, but he and I really liked the way it sounded, so we pretty much went with it. ― I didn’t know the “-ga” came from the Japanese word “moth!” So the Japanese names, “Zako (grunts),” “Goei (guards),” and “Bosu (bosses),” were decided then, too? Yokoyama – We just called them by what they were. Grunts, guards, and bosses (laughs). ― So then those defined names just became their official names then (laughs). ― I recall you mentioning earlier of how you came up with Dual Fighter mode, and that it was born when you were thinking of how the enemies could attack, not from the concept of power-ups. Yokoyama – But there was 1 problem in relation to it – we used up all the sprites (*16) called “objects” back in the Namco days. What that meant was that we couldn’t fire 2 missiles when Dual Fighter mode was activated. That led to some intense discussions on what to do, but in the end, we simply decided to write 2 missiles within the sprite’s 16x16 dot (*17)). ― I’m surprised how you came with the concept of drawing 2 missiles when you were actually shooting only 1. Yokoyama – Whether that encompassed the concept of what a power-up is supposed to be was questionable. After all, the trade-off with this was that the spacefighter would now have double the size in hit collision. After we incorporated Dual Fighter, we had our guys test it out, but it turned out that no one used Dual Fighter mode. A single unit had a smaller hit area, so they lasted longer that way. So creation of the Challenging Stage balanced out the purpose of using Dual Fighter mode. ― I can relate. Challenging Stage is easier while in Dual Fighter mode. Yokoyama – That’s why you had a slim chance of survival while in Dual Fighter mode during the latter part of the stages, unless you could blast most of them while they were entering the stage. ― So, I assume you were deeply invested in conducting research on Galaxian? Yokoyama – Back then, I was the best player within the company. I used to last forever playing Space Invaders (*18) when I was a student, so I naturally became good at playing video games. That kind of propped me to become the go-to guy when monitoring Galaxian (laughs). ― So that experience worked positively towards Galaga. Playing the previous version must have made it possible for you to design the game, such as with how enemy fire stopped when you defeat the boss. Yokoyama – I guess you can say that. In Galaxian, the boss flies in a formation of 3, and first shooting down the guards then shooting the boss gave you a higher score. Well, that was a feature that was added later in development. I mean, you know how people are wowed when you make a neat move, right? I wanted to bring that “wow” into the scoring system. Galaga was a game that was created with that kind of added feature, and this adding of features is the root from where the game was built from. ― King & Balloon was a shooter that appeared before Galaga, but are there any connections between the two? Yokoyama – I didn’t come up with the King & Balloon plan. There was 1 more plan that wasn’t themed on space back when Sawano-san (*19) made Galaxian. I just created a plan off of that as Director. So the base plan was there all along. ― But, Galaga was created from the very base of planning, correct? Yokoyama – Yes, though King & Balloon didn’t have a rapid-fire feature because it was made off of the Galaxian board. You know how the enemy abducts the king? That’s an emergency situation, right? So it’s only natural that the player would want to shoot as much as possible. But because you couldn’t, we just made the shot faster than the shot speed in Galaxian. Everyone asked for a rapid-fire feature, but you know, sprites stood in the way of making that a feature. ― I see. That means the concept of having a rapid-fire feature was in your mind since then. I presume the new board brought that to life. Yokoyama – Yes. That made possible things which weren’t possible before. ― What difficulties did you face in developing Galaga? Yokoyama – First and foremost, it was with how we had to reset our plans back to scratch with the change in boards. Having to rethink plans, we had a heated argument over the cabinet. Yokoyama – Well, before Galaga made its appearance, both Galaxian and Pac-man had the buttons and joystick designed upright onto the table cabinet. But for Galaga, which featured rapid-fire, that made the button difficult to press. Difficult in the sense that the button was designed so that it works best on games like Galaxian where the button presses are deeper and longer. So I had a discussion with the experts behind cabinets and tech to apply a horizontal design (*20). ― You were making decision for things like that, too? Yokoyama – Well, we did make the prototype, and it turned out that it was way easier to play with the hand placed on the cabinet. Next I asked to have the buttons changed, so then we tested out a variety of buttons. ― I recall how light and easy it was to press the button. Yokoyama – Well, there were a lot revolving around that too. We had to consider weight, depth of presses, and durability, so we brought in a whole lot of buttons and made a decision from there. ― So, Galaga was a first in bringing about the horizontal control panel. It changed the form of table cabinets. Yokoyama – Those table cabinets were used in cafes, so we did get a sufficient amount of feedback in that people were concerned of how and where to put them. For example, how the cabinet would get in the way and trip people. In fact, this was a shared opinion among some of those in Marketing. So I discussed over it with various departments, and had both cabinets tested. In the end, we decided to go with whichever is easiest to play on, and that led to the horizontal design. Well, I was thoroughly scolded by a certain someone for adopting that cabinet, being told that “there’s no way it’ll sell.” In fact, I was also told to change it back, but on the other hand, many others supported it and said this was better, so I just went with it. I’m sure glad I didn’t cave in then. ― And since then, all the cabinets use a similar design. Yokoyama – You can’t imagine how strongly I was yelled at. I seriously thought I was done for then (laughs). Released in 1978, Gee Bee was Namco’s first arcade video game release. The game introduced a new style of gaming by fusing block crushing with pinball mechanics. An arcade video game that was released in 1979 to become Namco’s first space shooter. The technology used for the game brought about visuals that weren’t seen before in the time. An arcade video game released by Namco in 1980. The game is recorded in the Guinness Book of World Records by selling 293,822 units. One of Japan’s greatest iconic video game character that is known throughout the world. A circuit board used for games. Used to display game images and sounds. Arcade games in the 70s manufactured differing boards for each game, so it was commonplace for new games to find a way to use existing circuit boards. An arcade video game released in 1980 by Namco. A shooter where the player protects the king by controlling a cannon to shoot the enemy balloons. It was designed with rare and unique features of the time, such as synthesized voices and a no life feature for the cannon. The opening music was created by Mr. Yokoyama as well. Shigeichi Ishimura. 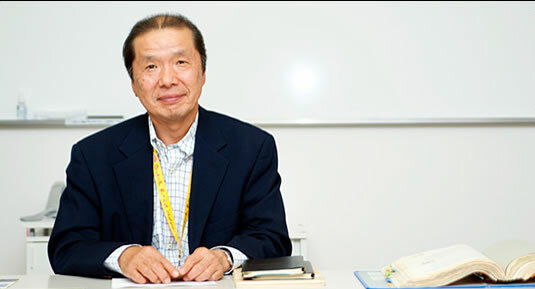 Former President and Representative Director of Bandai Namco Entertainment. An arcade video game released in 1980 by Namco. An action game featuring a blue car called “My Car” which the player controlled to reach each checkpoint while avoiding enemy vehicles. 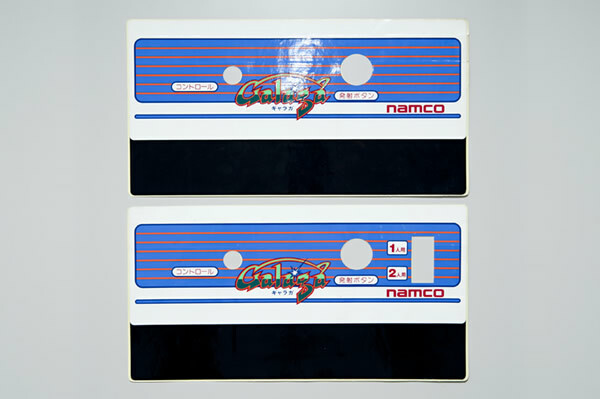 A side scrolling game, a rarity at that time, which featured 4-way scrolling, a radar system, and other unique Namco features. A person who handles programming. Back in the days, many people in development held multiple roles which included planning, designing, sound, and programming. A system where extra lives could be gained. In Galaga and Galaxian, extra lives could be gained after reaching a set score. A short demo where characters from Pac-man would appear for a few seconds on screen to perform various acts. Displayed after certain stages. Tohru Ogawa. Handled the programming for Galaga. An arcade video game released in 1981 by Namco. A space shooter featuring 8-way scrolling where the player objective is to destroy the enemy bases. An arcade video game released in 1982 by Namco. An action game where the player dug through the ground to fight enemies. The game introduced various new designs, such as its diagram-like game screen, fighting enemies by pumping, and more. Masaya Nakamura. 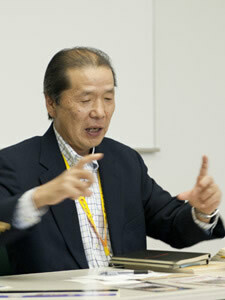 Founder of Namco and then President of Namco (currently, Honorary Advisor of Namco). Was known to personally check games before their release, and often times gave stern, but sound advice. A form of display for game characters on screen. 1 character could be assigned to 1 sprite to move on screen. 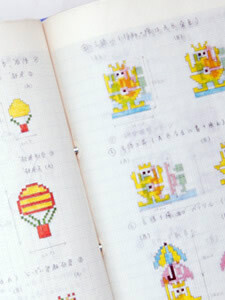 Back in the 80s, it was common in Japan to develop games using the latest in sprite technology. An arcade video game released in 1978 by Taito. It’s called a pioneer of video gaming, and became a huge hit in Japan. Kazunori Sawano. Person in charge of game development in Namco. 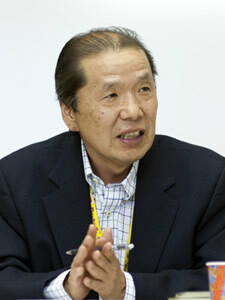 Former Director of Namco. The cabinet’s control panel (in Japan, “con-pane” for short) was placed horizontally so that hands could be placed on it. This started with Galaga. Before then, the control panel was placed upright.